Rev. 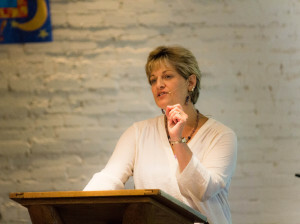 Vicki Michela Garlock, Ph.D. has over 25 years of speaking experience – first as a part-time lecturer in graduate school, then as a full-time college professor, and most recently as the founder of Faith Seeker Kids™. Her speaking experience includes conference plenaries, symposium presentations, small-group workshops, and Sunday morning sermons. Our Faiths, Our Stories. Ripple Interfaith Conference: Finding Your Voice…Interfaith and Storytelling, February, 2019, Elon University, Elon, NC. Plenary Panel with Kiah Glenn, Jem Jebbia, Rabbi Sandra Lawson, and Rev. Yolanda. Interfaith Education for Kids: Themes, Narratives, Crafts, Activities, and Experiences. ConNext Summit: Casting a Vision for Progressive Faith Formation, October 2017, Buffalo, MN. (l to r) Rabbi Sandra Lawson, Rev. Yolanda, Kiah Glenn, Vicki Garlock, Jem Jebbia. 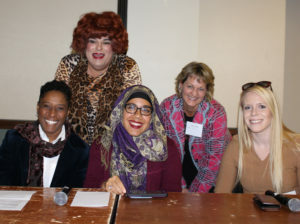 Humans as Storytellers: Implications for Interfaith Education. Ripple Conference: Interfaith and Storytelling, February, 2019, Elon University, Elon, NC. Cognitive Tools for Emotional and Imaginative Engagement in Eco-Learning: The Story and the Body. Parliament of the World’s Religions, November 2018, Toronto, ON. Presented with Gillian Judson (Simon Fraser Univ.) and Gina Marucci (Vivian Outdoor Resource Centre). Justice, Care, and Religious Affiliation in Moral Development: Brief History and Recent Research. Parliament of the World’s Religions, November 2018, Toronto, ON. Creation Curriculum for Kids: Narratives, Crafts, and Activities from the World’s Faith Traditions. Parliament of the World’s Religions, November 2018, Toronto, ON. Embracing the Darkness: Age-Appropriate Narratives, Crafts, and Activities from Around the World. ConNext Summit: Casting a Vision for Progressive Faith Formation, October 2017, Buffalo, MN. Interfaith Education for Kids: Age-Appropriate Narratives, Crafts, and Activities from World Creation Stories. North American Interfaith Network (NAIN) Conference, August 2017, San Diego, CA. Multifaith Bible Study for Children and Youth: Reclaiming the Heart of Humanity by Teaching Peace. Parliament of the World’s Religions, October, 2015, Salt Lake City, UT. Interfaith Bible Study for Children and Youth: Sacred Listening by Teaching Peace. North American Interfaith Network (NAIN) Conference, July, 2015, Regina, Saskatchewan, Canada. Ministering for the Earth…Tending the Heart of the Planet: Water Rituals in the Various Faith Traditions. Big I Conference, February, 2015, Burlingame, CA. Blog versions of this talk can be found here: Part I and Part II. Moses, the Hebrews, and the Plagues: History and Interpretations. Nacho Mama’s Bible Study, September, 2018, Jubilee! Community Church, Asheville, NC. Creation and Creation Care for Kids: Stories, Crafts, and Activities from Multiple Faith Traditions. Lake Junaluska Interfaith Peace Conference, November, 2016, Lake Junaluska, NC. Re-Imagining Education: The Wisdom of Story, April 2013, Jubilee! Community Church, Asheville, NC. Bringing Nature to Christian Education: Ideas, Resources, and Attempts. North Carolina Interfaith Power and Light Conference, October, 2010, Greensboro, NC. “Feeling Free: Tao Te Ching, Chapter 23.” Sermon delivered February, 2019 at Jubilee! Community Church, Asheville, NC. “Uncertainty.” Sermon delivered May, 2018 at Jubilee! Community Church, Asheville, NC. “Infinite Possibility.” Sermon delivered May, 2015 at Jubilee! Community Church, Asheville, NC. “Dreams of Assurance.” Sermon delivered May, 2014 at Jubilee! Community Church, Asheville, NC. “Religious Education without the Baggage.” Sermon delivered March, 2013 at Jubilee! 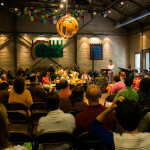 Community Church, Asheville, NC. 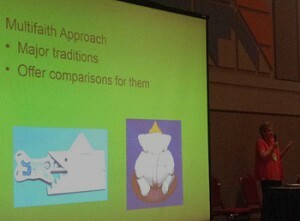 Vicki can speak on a variety of topics related to interfaith education. Click here for bookings.